Close to Church Circle, near the top of Annapolis’ Main Street, sits McBride Gallery. 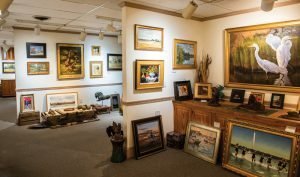 Framed artworks are displayed in the storefront’s windows, and inside, oil paintings share space with watercolors, pastels, ceramics, and small sculptures. The gallery’s seven rooms are traversed in a circle—its walls lined with masterfully created artworks. The space resembles someone’s home, with furniture placed here and there. While visually exciting, the atmosphere is decidedly calm, perhaps meditative, a testament to the gallery owner’s discerning vision. This is Cynthia McBride’s world. McBride has a school of thought governing her gallery shows. Her philosophy is all about the great idea. “Artists have a good painting idea,” she reasons, “and if they have a great painting idea, that’s the start of a wonderful painting.” She applies this concept to organizing her shows, with such titles as Women Artists of the West, Best of the Chesapeake, Looking Back: Memories, and 100 Plein Air Painters of the Mid-Atlantic. 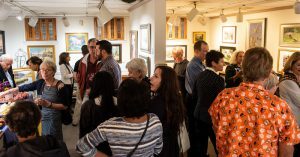 Gallery shows have openings on Sunday afternoons, often with live demonstrations or artist talks, and are always well attended. Art lovers and artists gatherer at McBride Gallery to view the 10 painted violins painted by local artists to raise funds for the Annapolis Symphony Academy. In 1972, after graduating from college and as a young bride living in Massachusetts, McBride decided to open a small business. “I really hadn’t been in any art galleries, growing up on a farm and then off to college; I’d seen them from the outside, but I thought, ‘I can do that. I know a lot about art,’” she recalls. 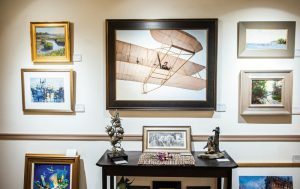 She opened The Original Gallery in Hull, Massachusetts, selling original artwork and offering custom framing. “When you’re 25 and you’re deciding you’re going to open your first business, you think you can do anything.” She learned how to frame, work in a store, and run a business. 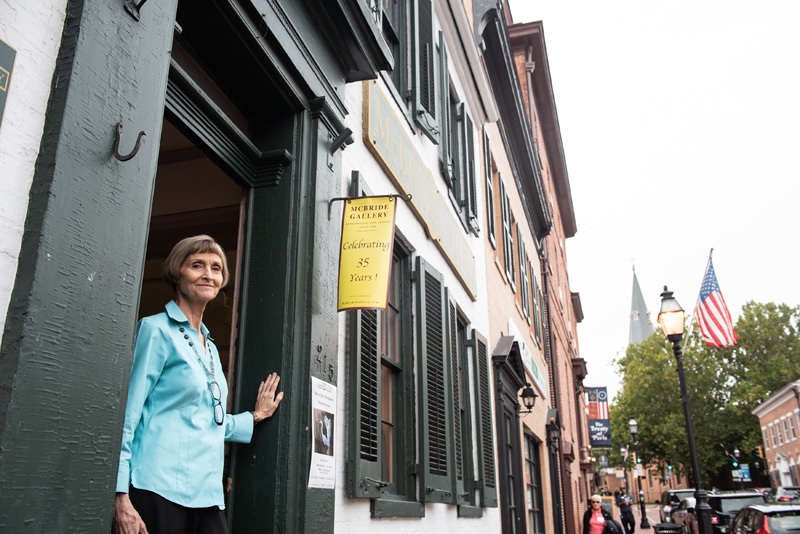 She went on to owning successful galleries in Sewickley (Pennsylvania), Annapolis, and Severna Park, promoting local and nationally known artists and custom framing. The lifestyle suits her; she was able to work while her daughters attended school. 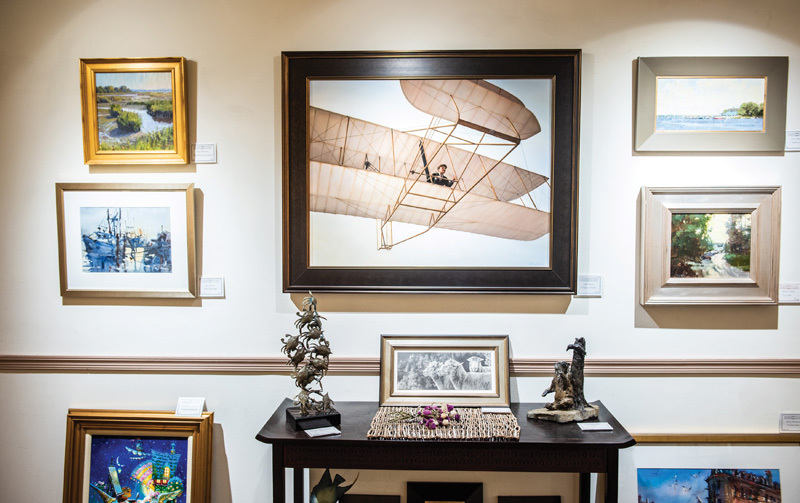 A McBride-owned gallery has been a significant presence in the Annapolis art scene since 1978. McBride developed The Best of the Chesapeake to showcase art made in the mid-Atlantic. Artists come to this area from as far away as Canada for the inspiration of the Chesapeake Bay. This yearly show is juried, with cash prizes to artists in different categories. The show’s artwork is for sale, with prices ranging from $425 to $15,500. Choosing a favorite piece is a matter of personal taste—and, of course, budget. She takes great pleasure in helping people understand what makes a good painting. “How do I know what’s good?” and “I really don’t know what I like.” are statements she hears often. “Everybody has the ability . . . to appreciate beauty,” says McBride. “What we don’t always recognize is composition and design.” She encourages patrons to trust their eyes to know if something is pleasing or perhaps a bit off. Abigail McBride has a strong presence in her mother’s gallery. A skilled still-life and landscape artist who works in oils, she got her first painting lesson from her grandmother Karlsson on the Minnesota family farm. Many of her paintings are made on trips to visit her 101-year-old grandfather. Thus the family tradition continues. Error: Error validating access token: Session has expired on Saturday, 09-Mar-19 15:57:50 PST. The current time is Friday, 19-Apr-19 11:49:19 PDT.